Firstly, let me apologise for the failure of a true link up with the children. I got a comment from a parent on someone else’s blog and realised that maybe I needed to put more safe guards in when we want to do something like that again. I do hope you were able to go and visit 100WC as it is growing even faster than the grown up version! Click here to enter your link and view this Linky Tools list. It will take you to another page but I will pop it back here as soon as possible! Hi my post for the 100wcgu is number 36 Balance the Scales of Justice on the Linky list and when I click in the link in that list it takes me straight to my blog post on our school blog. However I can’t understand why you see it as a draft and can’t read it. Are you able to delete no 36 from the Linky list and I’ll try to add my link again? Many thanks and sorry for causing any problems. I really like the 100wc. I found this site through LimebirdWriters. What a great idea! While I’m thoroughly entrenched in a novel at the moment, these little exercises are sometimes just what I need to really THINK about what words I’m using. I hope that my submission adheres well enough to the theme. If not…oh, well. It was fun to try! 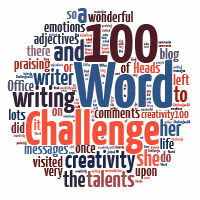 Pingback: 100 Word Challenge: Everyone Loves Neville | Even More BonusParts! Pingback: Samples on the Flip Side « Does writing excuse watching? does “flip” have the common meaning of “not serious” in the UK, as it does in the US? It can do! Sounds interesting!